This CILANTRO CHICKEN STIR FRY recipe is an easy, delicious, and HEALTHY dinner you can make in just minutes! So much flavor and none of the fuss. Loaded with chicken, peppers, onions, and cilantro...yum! Dry your chicken on both sides with a paper towel and season with salt and pepper to taste. Heat 2 tablespoons olive oil in a large skillet over medium high heat. Add in chicken and cook each side until brown, about 2-3 minutes per side or until nearly cooked through. Remove chicken from the skillet and set aside. Add the remaining two tablespoons olive oil to the skillet along with the minced garlic. Stir to combine. Toss in all the veggies and stir while cooking until starting to brown and become tender. Add in the vinegar, soy sauce, and chicken broth, and stir to combine. Allow to simmer down for about one minute, then toss in the cilantro and stir. 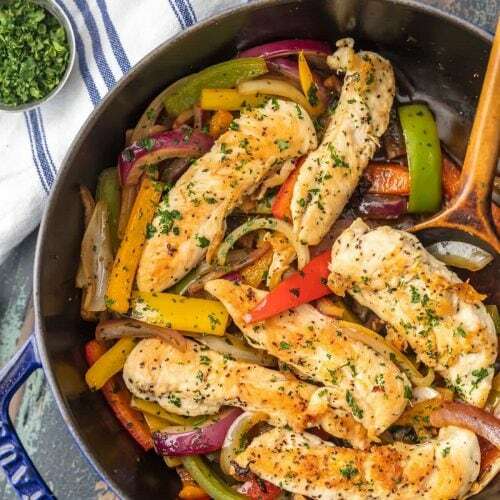 Return chicken to the skillet and nestle in the veggies, allowing to cook for 1-2 minutes more until chicken is fully cooked through and warmed.